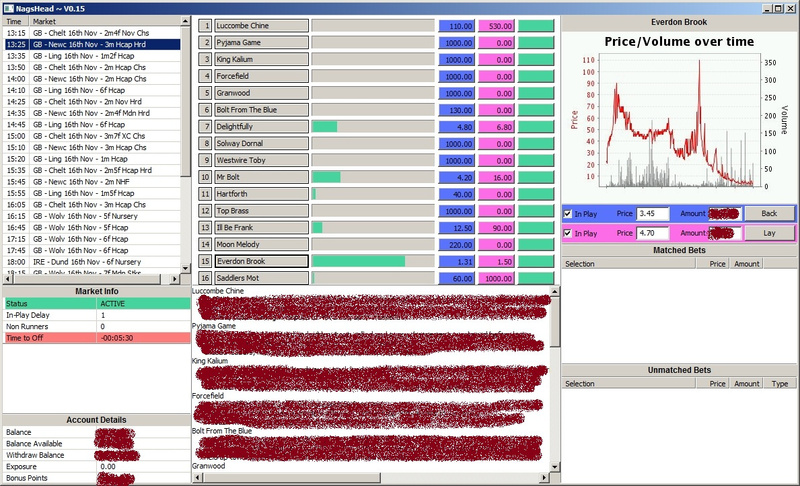 There are literally hundreds of application written for the Betfair betting exchange. The problem is that most are subscription based and it takes a lot of profitable bets before subscriptions are worth taking out , I also found that most of them are to complicated (or too simple) for my needs and the lack of "scripting" was also a problem for me. As always, the big question was "what language and GUI libraries to use?" There are few reasonable choices and the temptation to go with the "usual suspects" was great as those would have great support for SOAP which is what the Betfair API is based on. I've had a lot of bad experience in the past with GUI's like MFC, Delphi even Java (which is why I've been using web technology for most of my work for the past few years) and the fact that I just *love* PHP made me look for an alternative. I came across wxPHP by "accident." I knew of the Python binding for wxWidget and just out of curiosity I thought I'd goggle for 'wxPHP' and to my surprise found this web site and the rest as they say is history. This is the first one I've written using the wxPHP library and I've found the experience both exciting and annoying at times. I think that one of the reasons why a love PHP is the excellent documentation and easy access to it. wxPHP is a new(ish) project and I've found the HTML based documentation limiting and at times annoying as searching and navigation is a bit of a hassle. HOWEVER, the wxPHP itself is a joy to use. I had a running version of this application in 4 - 5 days and considering that I've never written a program with wxWidgets and this was my first brush with wxPHP, too, I think speaks for the library. I'm now in the 4th week of using wxPHP and there is a bit more to do before the app is finished and I can honestly say that with wxPHP about, I have no need for any other library. Jeff has done a great job with wxPHP and we've finally have a GUI library for PHP that is small, fast, attractive and easy to use. This application, although it might not look much from the screenshot, is excercising a fair number of wxWidget controls and helper classes, from the simple label, button controls to buffered DC's, sound and image files etc. My next step (after finishing the last 15% of the code) will be to try and run the app on a Linux box. I've got openSUSHI :-) installed but never actually used for anything other than trying to impress friends and family with it, maybe I can use it for something useful now. Anyway, that's all for now just a *big* thank-you to jeff and the team for their great work they've done bringing this excellent GUI library to the PHP world!